Probably founded by Calicidesi settlers, originating from Cuma (Neapolis, 5th Century BC), defended by the Etruscans, Sanniti and Carthaginians, Naples was annexed to Rome in 326 BC. 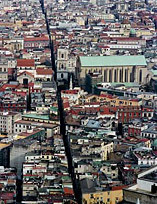 Impoverished to a municipality (90 BC) because of Pozzuoli competition, it was nearly destroyed by the faithful connections of Silla, since they were faithful to Mario (82 BC). During the Greek-Gothic wars, it underwent sieges and pillage (553), but was still able to keep its autonomy under the Episcopal, even against the Longobard threats (7th Century). Constituted as a Duchy (Duke-Bishop Stefano I, 755-800, it was conquered by the Normans (1139) who favoured its economic development. After passing hands to the lineage of the Svevi (1187), it became a great cultural centre, when the Stadium (University, 1224) was built on behalf of Federico II. There were revolts against the Svevi under Corrado IV (1253), and then the City was occupied by the Angioini (Carlo I d’Angio, 1255) and became the Capital (1282) of a new autonomous state entity, which was called the Reign of Naples. Passed to Alfonso of Aragona (1141), who was involved in the wars between the French and Spanish, it was then occupied by the Spanish in 1503, therefore becoming the capital of the viceroyalty. It was a cultural and artistic centre for the entire 18th Century, but was also troubled by economic crisis and overpopulation, so much so, that the unhappiness of its population often broke out in open riots (for example the episode of Masaniello, 1647). Depopulated by the Plague (1656) and disturbed by the rivalry between the nobility and the Government (Conspiracy of Macchia, 1701), it passed hands to the Hapsburgs of Austria (1707-24) for a certain period and then to Carlo of the Bourbons of Spain (1734), who once again, made it the capital of an autonomous region. The spreading of the culture or age of enlightenment and revolutionary ideals favoured the constitution of the Partenopea Republic (transitory revolutionary attempt which lasted from 23rd January to 25th June, 1799). Occupied by the French (1806) and assigned first to Giuseppe Bonaparte, then to G. Murat, by the Congress of Vienna (1815), it then returned to the Bourbons (Reign of the Two Sicilies). All in all, the liberal movement remained active (revolts: 1820-21, 1848), until the Garibaldina occupation (7.9.1860) and the City’s passing under the Reign of Italy. During the Second World War, it only managed to free itself from the Nazi-Fascist occupation (Four days of Naples, 27-30 September 1943), preceding the entry of the alliance troops (1.10.1943). The various stages of the history of the City are also represented from an artistic point of view. 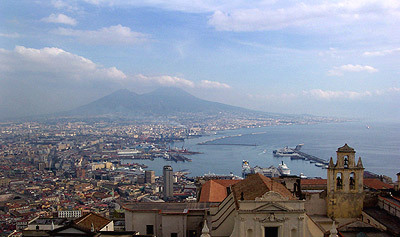 Naples hotels guide to choose your hotel, B&B and apartment in Naples by location, fee or category: secure bookings. Sorrento hotels guide to choose your hotel, B&B and apartment in Naples by location, fee or category: secure bookings.